Spoiler-free thoughts on episode one. 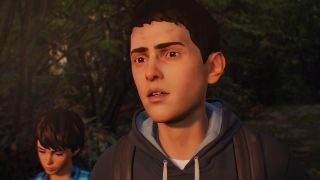 For a top-line, absolutely no spoilery bit of guidance as to whether you might enjoy Life is Strange 2: Episode 1, it’s as follows: If you enjoyed the first season or the Captain Spirit mini-sode, you will be right at home. If you did not, it’s far more of a gamble and depends on why those games didn’t appeal to you. The tone, the story, and the cast of characters are different to season 1 so if Chloe and Max specifically weren’t your cup of tea it’s worth trying again. If the storytelling systems, the basic setup of teens and supernatural phenomena or the aesthetic rubbed you the wrong way, then it’s a far harder recommendation, particularly with the addition of a frustrating and lengthy sketching minigame. If you haven’t played any of Life is Strange or its spin-offs, I’d say it’s worth downloading either Life is Strange 1: Episode 1 or The Awesome Adventures of Captain Spirit. Both are set in the same universe and both are free, so you can get a sense of how the story choices and light puzzling work. Of the two, Captain Spirit gives you a better sense of the mood this season as brothers Sean and Daniel Diaz venture far from home. I’ll dig a bit deeper to unpack those points, not giving spoilers per se, but the following is stuff to avoid if you want to go in truly knowing next to nothing and if you haven’t watched the “Seattle” scene the devs put out recently. The game’s main themes are ostensibly brotherhood and caretaking/caregiving. Sean finds himself needing to look after his little brother as they head south from Seattle with only the barest provisions. The choices you make not only shape the character of Sean and his story, but they have knock-on effects on Daniel. But given this is only the first episode, any far-reaching consequences from the first leg of your journey are a way off. Instead, though taking care of Daniel (and Sean) formed the bulk of the experience, episode 1 was perhaps most notable for its current political concerns. Life is Strange season 1 often felt like it could have taken place at any point from the early '90s to the present day. There was a slightly unreal, Instagrammy nostalgia to its high school drama, despite the modern tech and social media platforms. I’ve talked elsewhere about how reminiscent it was of various types of fanfiction and original fiction (and I don’t mean that as a slight—it’s a fascinating community of writers finding their feet and finding themselves so it can be particularly apt for teen stories). Life is Strange: Before the Storm was set earlier still and offered up another round of familiar flashpoints for teen activity—a school play, for example, or a rowdy gig at an abandoned sawmill. I’d like to play a couple more times to figure out how much I like the balance of predetermined events and personal choice. But season 2, at least as far as episode 1 reveals, is resolutely anchored to the present. It has some of the familiar Instagram filter aesthetic touches, and sometimes ventures into teen fiction tropes—most notably using the main character, Sean Diaz’s ability to draw, as shorthand for the character being sensitive and creative. But the broader themes are topical and overtly referenced—this is a game which takes on systemic and individual racism, includes references to Trump’s wall, and whose catalyst for action is racial profiling and police brutality. Episode 1 currently exists in a vacuum so it’s impossible to know how the game will navigate those waters over the course of a season. I’m cautiously excited to see a developer tackle the subject and to begin with a strongly sympathetic portrayal of the boys at the centre of the drama. But I also remember that although I loved season 1, it definitely hit some duff notes and sometimes felt like it was forcing the player towards particular emotions by leaning hard on melodrama. That makes me a little wary as to what’s to come (even though I don’t doubt the studio’s sincerity). I’m therefore keen to read other perspectives on how these themes are handled, not least because Dontnod is a French rather than American studio. I’d want to know from other people whether it rings true or whether it throws up problems I haven’t considered. I’d also like to play a couple more times to figure out how much I like the balance of predetermined events and personal choice. Broadly, though? The awful sketching minigame aside (seriously, I had to switch to a controller for those segments to even work, waggling the left stick around for minutes on end to reveal a drawing), it’s a confident opening episode with protagonists it’s easy to root for.